← Deals to Keep You Moving This Winter! Don’t know what to do with all that spare time now that the holidays are over? Now is a perfect time for some home improvement! 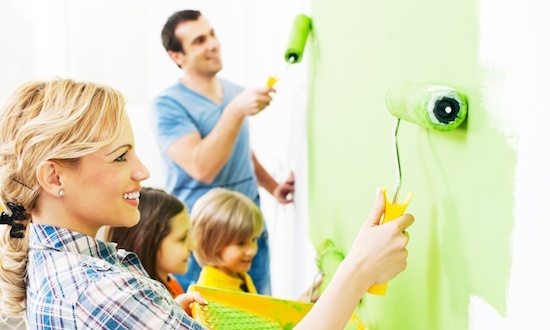 Not only will a home improvement project distract you from the cold temps outside, you can involve the whole family for some quality bonding time. And with fantastic savings from our most popular merchants, you’ll get great prices on everything you need to get started AND earn a little something for your school in the process! Here are just some suggestions on how to clean, de-clutter, and spruce up your home for the new year! Are all your holiday gifts causing clutter in your home? This Rubbermaid 18-gallon storage tote from Home Depot is the perfect place to store all your knick-knacks, and it’s now 10% off! This sturdy container is made for a lifetime of durability and strength, and can withstand harsh temperatures, so it’s perfect for your garage or attic. What better time to clean out that upstairs closet you’ve been neglecting? If you have a pet, you know they are important members of your family. However, they can also leave fur, dirt, and hairballs everywhere, which can be difficult to clean. Luckily, the light-weight Dyson Animal Upright Vacuum is specifically designed to remove dirt, dust, allergens, and pet hair from your home. Visit K12Rewards to purchase it from Target today to get 28% off and help your school to boot! Looking to get in shape but don’t want to spend the money to join a gym? Sears is currently offering great deals on home fitness equipment, such as this Proform CrossWalk Full Body Workout Treadmill on sale for $455.99, marked down from $599.99! Make your home your own personal gym this year, and you’ll have no excuse not to work out! With winter still in full force, our merchants have everything you need to make your home clean, warm, and cozy, so you’ll never want to leave! Visit K12Rewards today to earn money for your school and rewards for yourself with every purchase!